Honduras' president-elect said Tuesday he wants amnesty for ousted President Manuel Zelaya and for all of those involved in the June 28 coup that deposed him. "There should be (an amnesty) for all those involved," Porfirio Lobo said in Costa Rica, where he met with Costa Rican President Oscar Arias and Panamanian President Ricardo Martinelli in an effort to build support for his presidency and break his nation's isolation. Lobo has said he hopes to open dialogue with Zelaya and start national reconciliation after he takes office Jan. 27, when Zelaya's term expires. Lobo's options, however, are limited. Even once in office, he cannot grant Zelaya amnesty from prosecution. That power belongs to the same Congress that voted 111-14 this month against restoring Zelaya to office to serve out his term. Zelaya faces abuse of power charges for ignoring a Supreme Court order to cancel a referendum on changing the constitution. The dispute led to the coup. Western Hemisphere countries united to condemn Zelaya's ouster but are divided on whether to recognize Lobo's election. Arias and Martinelli said they recognize Lobo's victory in last month's presidential election, but added that they won't offer their full support to his government unless a U.S.-brokered political accord is implemented and interim President Roberto Micheletti steps down. The accord calls for the creation of a unity government and a truth commission to investigate the events leading up to the coup. "Micheletti still needs to leave his post and who will replace him will be an internal decision," Arias said. 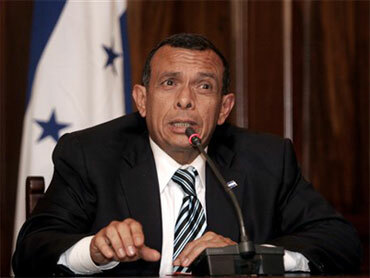 Micheletti, who was named president by Congress after Zelaya was rousted from his bed by soldiers and flown to Costa Rica, has said he will step down if Zelaya leaves Honduras. Zelaya has been holed up at the Brazilian Embassy in Tegucigalpa since he sneaked back into Honduras on Sept. 21. Zelaya's aides have said he will not leave the country, at least until his term runs out. The United States, which cut off development aid and anti-drug trafficking cooperation with its impoverished ally after the coup, says Hondurans had the right to choose a new leader in regular elections that had been scheduled before Zelaya's overthrow. Peru and Colombia share that stance. The South American trade bloc Mercosur, which includes Argentina, Brazil, Uruguay and Paraguay, announced Tuesday that it will not recognize the results of Honduras' because the country refused to let Zelaya serve out his term. Venezuela and other leftist-led governments have also refused to recognize the elections, saying doing so would legitimize Central America's first coup in 20 years. Also Tuesday, the U.S. State Department lifted its travel alert for Honduras, saying the improved security situation there has removed the immediate threat to the safety of U.S. citizens in the country. The U.S. issued the alert after the coup sparked protests, primarily in the capital.